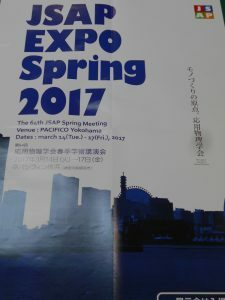 TOP > Posts > News > March 15 (Wednesday) – 17 (Fri) We exhibited at the spring seminar lecture meeting of Applied Physics Society. March 15 (Wednesday) – 17 (Fri) We exhibited at the spring seminar lecture meeting of Applied Physics Society. Booth location　Ｐｓｐ－１７　Please stop by all means.